The saga of “Detroit vs. Everyone” has a host of racial, social, and economic factors – but who knew it included legislative action? The Metro Times was sent this map from a reader and dug up some interesting history. The proposed plan passed in the Michigan House, but was sent to Committee to die. 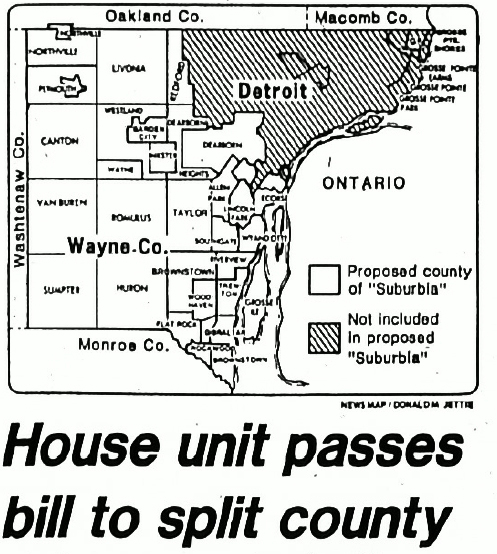 Can you imagine living in Metro Detroit where there was Suburbia County and everything Detroit and East? If anything this is an important representation of the municipal and legislative mentalities that have continued to push for this invisible line drawing.